This is only the second time in my life that I have attempted a watercolor on a full sheet of paper. The last time was around 1990. I was discouraged then over how long it took. I’m faster now and resolute about resorting to larger brushes! Still I’m already getting lost in some of the detail. The ghost signs on this turn-of-the-century landmark have me drowning in wonder already. Texas weather is unseasonably mild now. Temperatures should reach the 70’s today. I don’t even need the thermos of coffee I made this morning. I’ve brought a small TV/VCR combo out into the garage and am listening to The Teaching Company’s “Great Minds of the Western Intellectual Tradition.” Just finished Kant. 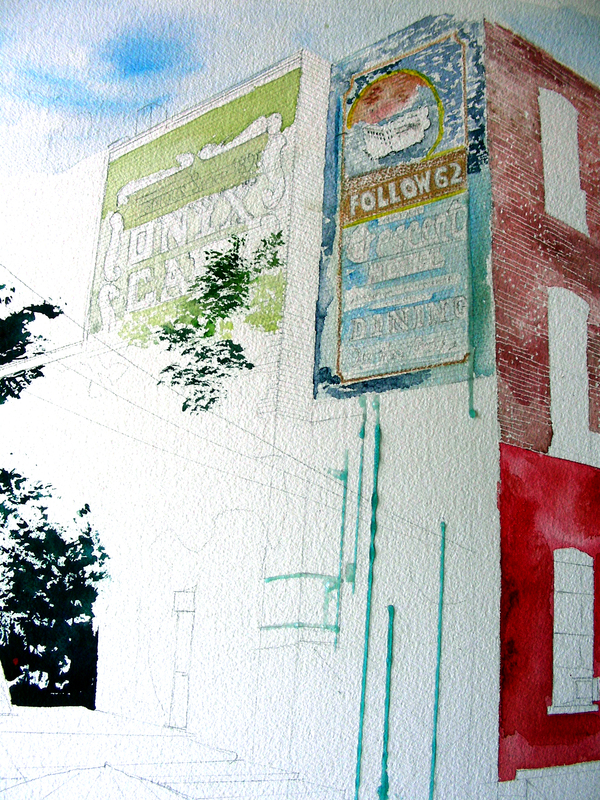 The lectures are keeping my mind fertile as I’m focusing on the details of the watercolor at hand. I leave for St. Louis to visit my family for Christmas in just a few days. I regret leaving this behind, and know that it’s not going to be finished before I depart. At least I’ll have something to look forward to when I return to my studio afterward. 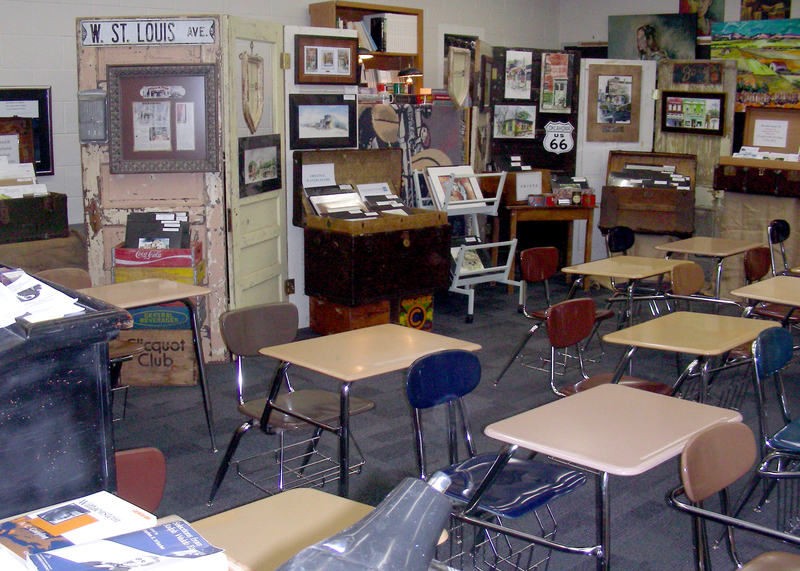 This “man cave” makes me laugh–I have no idea what to do under the hood of a car, own no power tools or table saws. So I’m out in my garage with the door up and my French easel visible from the street. I feel like a dork, but can laugh at myself in this. Several summers back, I photographed and painted this abandoned site along New Mexico historic Route 66. I’m trying it from a slightly different angle this time. One day I hope to make a large painting from this. The two current ones are about 12 x 16″. The light in New Mexico during the summer amazes me, and I regret that I haven’t returned to that state in nearly four years. Maybe I can make that a priority during summer vacation 2011. 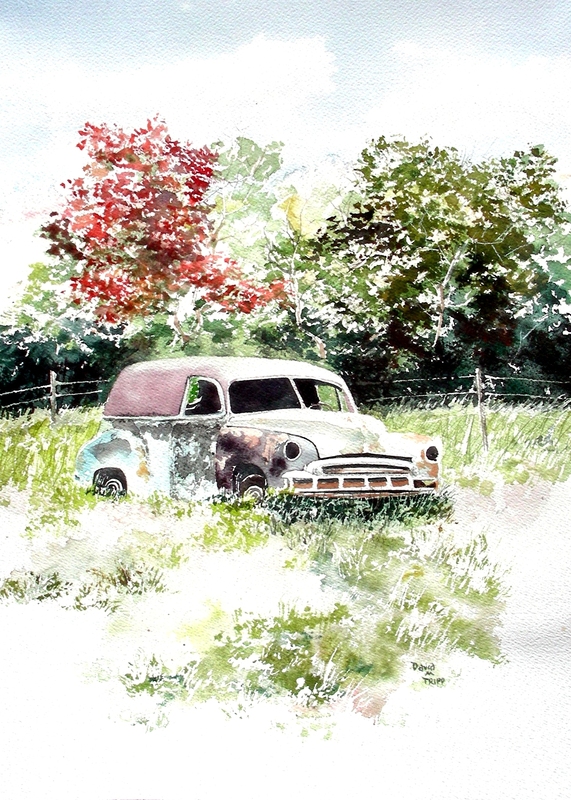 I have already painted this vintage car several times, but thought it was time to put some fall foliage around it. It is a 1950 Chevy Sedan Special Delivery, parked in a field north of Hillsboro, Texas, along Highway 77. The owner has graciously permitted me to come onto his property and do watercolor sketches en plein air of his collection of vintage cars. Hillsboro is a one-hour drive from where I live, across beautiful sprawling Texas country. I have Jack Kerouac’s On the Road that I listen to on CD as I drive and let my mind drift across the American landscape. 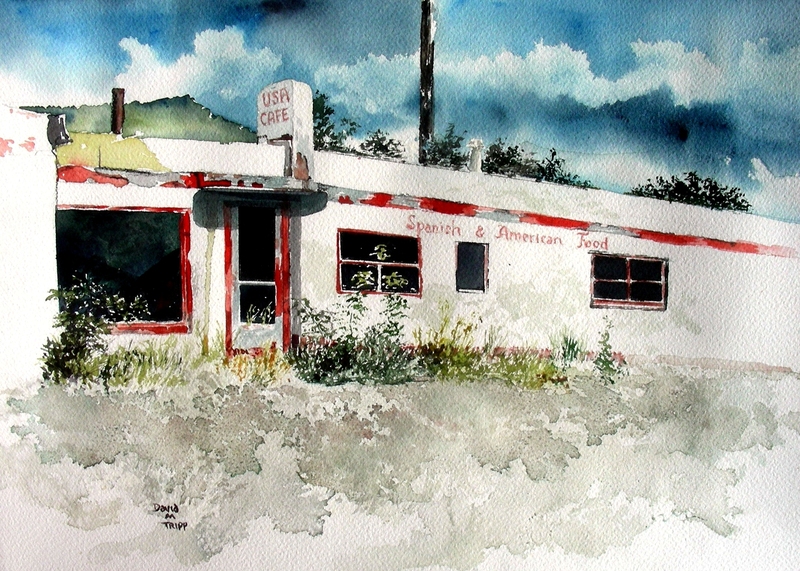 With my company’s name, Recollections 54, I still look for ways to translate the memories of the American fifties into watercolor compositions and vignettes. Even if I never reach the standard of quality that I target, I can already say that this journey has been a profoundly rewarding one. Soon I will journey to my hometown St. Louis for Christmas, and look forward to finding new vistas to record. 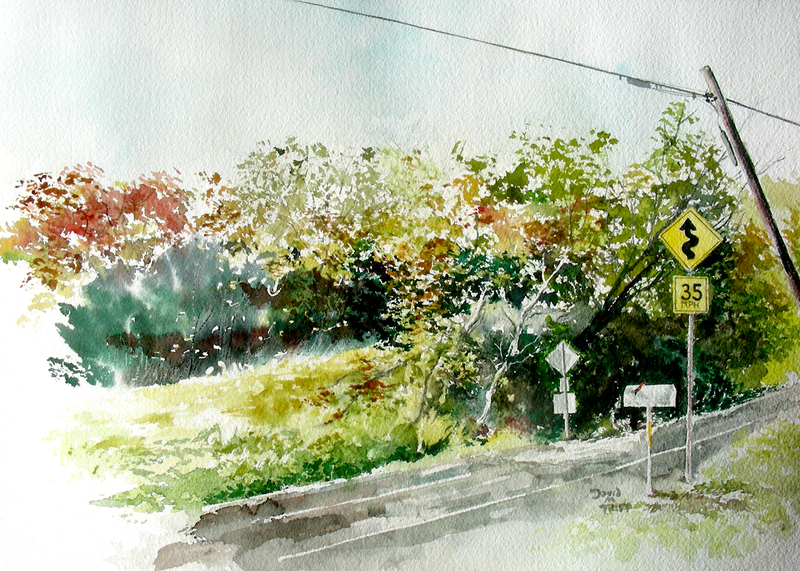 This is a small plein air watercolor sketch I did rather hastily as the sun was setting south of Fort Worth. 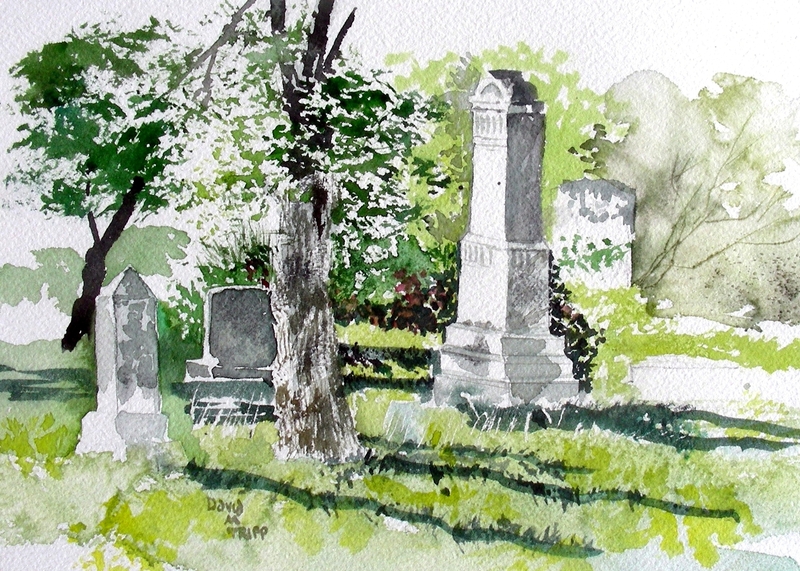 This cemetery is behind the lovely Cahill Methodist Church east of Interstate 35 on F.M. 917. I have painted the church three times, and one of the paintings is now the cover of a fiction novel published a few years back (the painting is “First Night in Waterford” and can be found on my website http://recollections54.com/). Though I painted this in the fall of the year, the sun was hot late that afternoon, and I worked rather quickly so I could retreat to an air-conditioned room and drink some kind of an icy beverage. I just didn’t get around to finishing it and posting it till now. Here is a large 18 x 24″ watercolor I began over a week ago. It’s been difficult finding quality time to paint, trying to close out the fall semester at school. My wife Sandi is riding her horse Andante just as the leaves are beginning to turn in south Fort Worth, Texas. Most of the foliage at the top is poured from bowls onto the wet paper that was previously masqued, then treated with salt and a spray bottle, along with plenty of tissue-blotting. For the first time, I’m introducing the color aubergine into the shadows of the bay horse–I’ve never before known for sure how to shadow this guy. I think this is going to work. I did a plein air sketch of the pair of trees behind the fence, several weeks ago while we were on location. I also took several digital shots of Sandi and Andante. Now I’m hoping to combine two photos to create this landscape. Hopefully I can finish this one by Christmas. Finally out of school for Christmas vacation! I am pretty backed up–I have completed a number of watercolors and have many more in-progress, but haven’t found quality time to blog any of them. Too many school responsibilities as the semester comes to a close. One afternoon, at the height of the fall season, I traveled south to Waxahachie, Texas. There was some art business to wrap up at the Ellis County Art Association. I always love to stop at Zula’s Coffee House, now located on the north side of town on Business Route 287. As the afternoon light began to fade, I saw this fabulous meadow across the highway from the coffee shop and decided to sit at a picnic table outside and try to capture it before the light was gone. The wind made things pretty difficult, and the darkness came quickly. Fortunately I had taken a decent digital photo of the site. 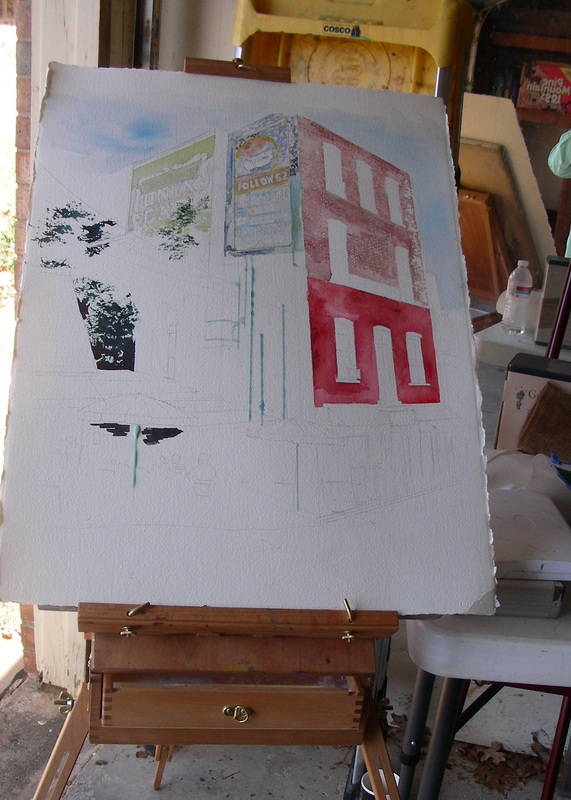 I returned to the site one more time to tweak the plein air colors in the foliage. Then I took this painting out to my garage to paint in the pure light of the afternoons, looking at an 8 x 10 print I made of the photo. I’m happy with how it finally came out. Texas has had a lengthy and comparatively colorful autumn this year. I find these rare, and am very grateful that I got out a number of times this season to capture the colors and light. 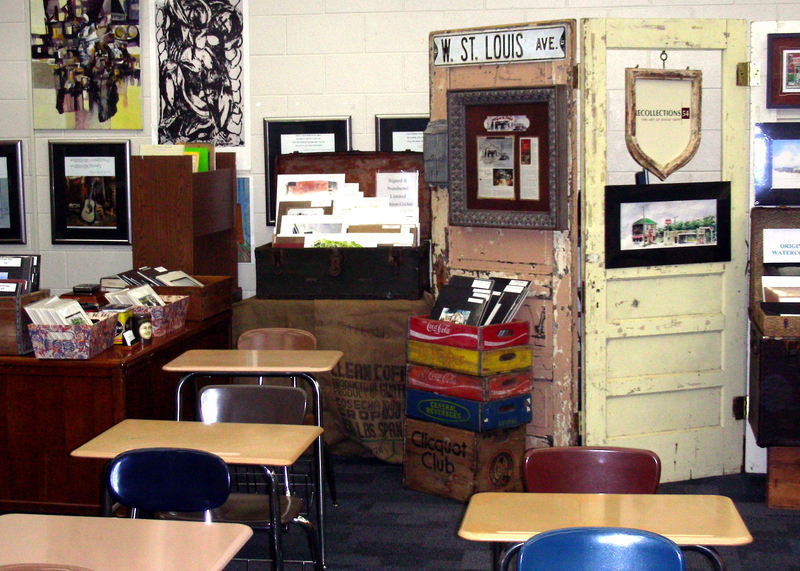 Now that the art festival season has closed for 2010, I thought I would bring all my art work and festival booth furniture into my classroom for the last two weeks of school before closing for Christmas vacation. I had plenty of visits from my colleagues and quite a number of sales as well. Coffee was served. Conversations were fascinating. I just loved the encounters, and it was nice to see art work behind my students instead of a blank public school classroom cinderblock wall. All the artwork came home with me this afternoon, and only the rustic doors remain. I’ll have to think of something else to do with them when I return to school in January. Meanwhile, I have plenty of new things to post, as I’ve been plenty busy painting and too busy to post! My brain was sucked dry by early afternoon. Today was Philosophy with Emerson and A. P. Art History with Byzantium. What a privilege to find bright sun, 50-degree termperatures, and the fall foliage still hanging around for the likes of me to chase it in watercolor. My French easel was still set up in the garage (the Jeep hasn’t been too happy with me, parked out in the cold on recent nights), and for once I’m glad I was a slob in not putting away all my watercolor supplies–they were all laid out, ready for me to pick them up. This is the second of the two paintings I started on the morning before Thanksgiving. After masking and pouring the purples, I left it alone, till this afternoon. 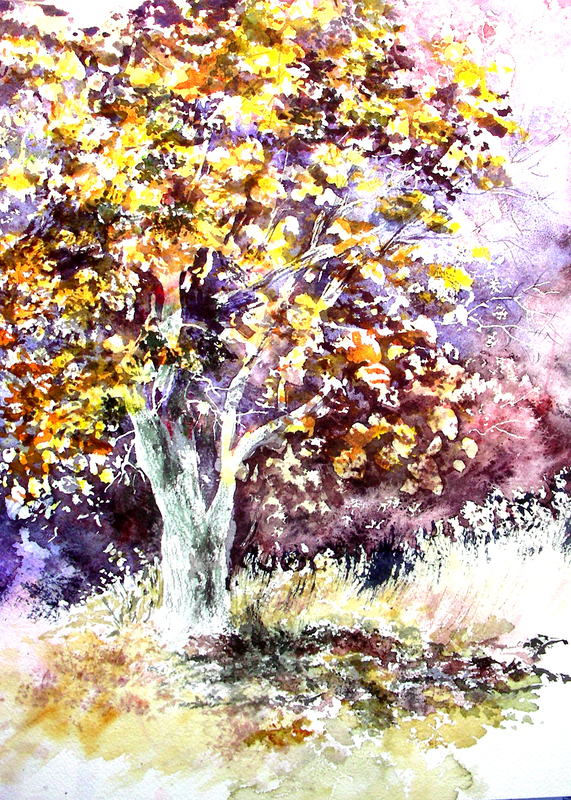 The time spent on it was rewarding for me–all cares simply elide when I’m stooped over a watercolor, and the thoughts improve in every area of life. I think the process is more restorative to me spiritually than the finished work is to others visually, even when I receive kind words for my work. I wonder if I should even call this “work”–it seems like play, and very wholesome play at that. I’m filled with gratitude for afternoons like today. Thanks for reading. 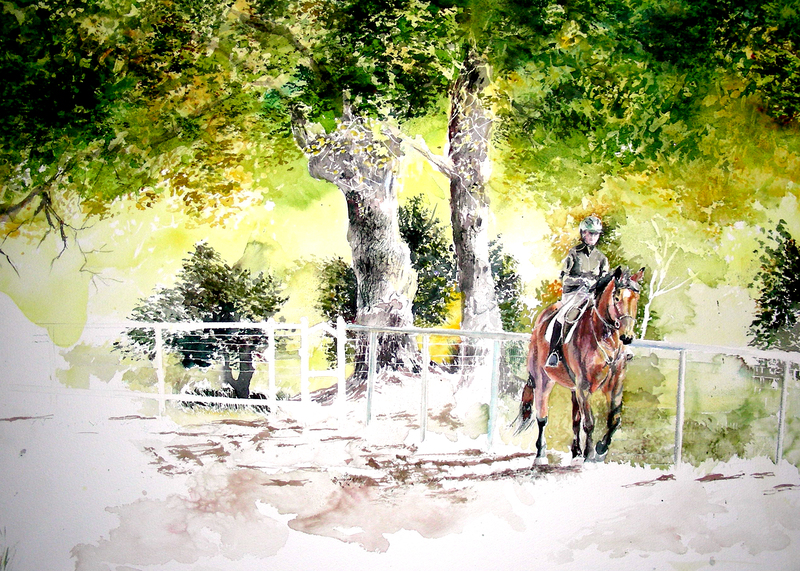 I did pour the first two layers of gold foliage on my newest equestrian painting. There isn’t enough to post yet, but I shall get it out there before you, quite soon, I believe.